Boomers drank milk, every day. At breakfast, it was milk with cereal. During the school day there was a milk break and more milk with lunch. And a glass of milk accompanied every dinner. That’s just the way it was. Milk was the parents’ beverage of choice for kids throughout the 1950s and ’60s. Consumption started dropping in the 1970s, and has continued ever since. But what if our beverage of choice wasn’t exactly a choice? How did milk become so important to the parents of the Boomer Generation? Our ancestors drank milk on occasion, but nowhere near the extent that boomers did. There were no government programs requiring milk in schools or ad campaigns reminding people of the nutritional value of milk. All that began to change during the Great Depression. The government began boosting milk with a WPA ad campaign through Roosevelt’s New Deal with images of the benefits of drinking the white stuff. However, the main goal of this program was not to make healthier children, but to increase demand in order to boost a flailing dairy industry and keep people — including the WPA artists — working. 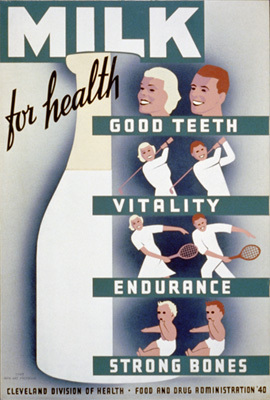 Federal Art Project, S. (1940) Milk — For Health, Good Teeth, Vitality, Endurance, Strong Bones. Ohio, 1940. In 1940, the first government program was instituted, providing federal assistance to supply milk to school children in the Chicago area. This was an effort to boost nutrition and health, especially among poorer families. Children whose parents could not afford the penny for a half pint were given the milk free in a partnership of government and private organizations that footed the bill. In 1946, the National School Lunch Act was signed into law by President Harry Truman. Having just fought a World War that relied on healthy young men to serve as soldiers, Congress was motivated to support a program for nutrition in schools as an important component to the health and well-being of the nation. It being Congress, the Act also encouraged consumption of nutritious domestic agricultural and dairy products that just happened to benefit their voting constituents. Included in the program was the mandate that each lunch contain between one half to two pints of whole milk. So the milk stage had been set before the first Baby Boomers arrived, but a technological advancement helped take milk to the boomer finish line: square milk cartons. Up until that point, milk was delivered in glass bottles or large metal canisters. Now, convenient quart or half-gallon cartons could be purchased and brought home, while schools could offer milk in half- and full pint containers. They no longer had to deal with bulk glass bottles that needed washing and storing. This is the era Mister Boomer remembers. His school sold milk in half-pint glass bottles that had a cardboard stopper in the top. If a boomer was careful, he or she could lift the tab on the top and pull the stopper straight out. More often than not, the cardboard tab tore, so it took a little fussing to get the bottle open and still have time to drink it in the allotted break time. Mister Boomer was thrilled when the milk began to arrive in cool three-sided triangle-shaped cartons. A straw was attached to each carton that was used to puncture a designated hole. The price of the half-pint was two cents in Mister Boomer’s earliest memories, jumping to five cents in a couple of years. His father, like all the other boomer fathers, gave Mister B and his siblings “milk money.” Despite the mandate and endorsement from parents, Mister Boomer was not a milk lover. He tolerated it in cereal, but when it came to drinking it straight, Mister B had two stipulations: first, it had to be ice cold; and second, if at all possible, it had to be chocolate milk. Fortunately, his parents agreed to let him have chocolate milk at school. Mister Boomer recalls the cases being delivered into the classroom. There were only three chocolate milk drinkers in his class of 30 kids. For years, Bosco and Nestle’s Quik saved him from the taste of plain white milk at home. The beat went on in 1966 when President Lyndon Johnson signed the Child Nutrition Act that authorized a Special Milk Program. This Act incorporated the text from the National School Lunch Act of 1946 that provided free or low cost milk to children, regardless of whether their school participated in the federal child nutrition meal service programs. The government reimbursed schools for distributing milk. The result was that milk consumption increased by ten times since the dawn of the Baby Boomers. After the Boomer Generation, milk wasn’t pushed on families as much as the previous three decades and consumption dropped. That’s when the dairy industry began its now-famous milk campaigns of the 1980s and ’90s. First was the Milk. It does a body good. campaign that, like Wonder bread in the decades before, stressed the bone-building calcium and protein aspects of building a strong body. That was followed by the got milk? campaign in 1993, that tried to put milk in the indispensable category for every home. The milk mustache off-shoot of that campaign — featuring loads of celebrities with milk mustaches — attempted to add a cool factor to drinking milk. Currently, the campaign is attempting to say milk is integrated into a healthy lifestyle with a Milk Life tagline. The dairy industry has spent over a billion dollars on advertising milk since the 1980s. And milk consumption continues to fall. Some say the nutritional value of milk was overrated as far back as the 1950s. Today we know a lot more about the fat content and nutritional value — or lack thereof — in a glass of milk. Vitamins once thought critical for growing bodies can be acquired through any number of good food choices. If only Mister Boomer knew he could eat fresh vegetables instead, he could have avoided a lot of sour-faced gulping to finish a glass. Did milk do your body good, boomers? Next Next post: Holy Schnikies, Batman is Gone!